Kinetico Water Softener Re-Build Kits. Universal Kinetico Softener Head Design. Upgraded Complete Seal Kit For All Kinetico Softener Heads. Now Includes - Actuator Head Seals and Piston Ring Seals. The high cost of servicing your Kinetico water softener prevents many people from getting the full benefit of the appliance. When these softeners get neglected and not serviced properly they often are not working to their full potential. They can "eat" salt like you wouldnt believe and not work at all efficiently. Almost all faults are solved by replacing a few essential seals within the water softener head itself. Will this service Video apply and internal spare parts kit fit your Kinetico Water Softener? The simple answer is yes. The water softener head has a specific design and those very important seals will fit all designs. They are all special seals that need to be a precise fit, consisting of the special X seals or Quad seals; these seals need to be fitted properly. Full contents of Video are shown here below. Brand New Video - Video Format - Shows Step by Step Instructions. 40 Minute Video - Easy to Follow. Can you simply order these parts from your local Kinetico dealer? Kinetico have a policy of only supplying parts to their authorised installers and dealers. They do not advocate the do it yourself repair of their products. In addition, they do not sell the quad rings and O ring seal kits, nor do they supply these parts to dealers. They only sell entire component blocks or levels where the cost to you is much higher, often hundreds of dollars higher; 99.99% of the time the large components that Kinetico service engineers would fit only require small seals fitting. These components include the inlet and purge valves which mostly only require new quad rings, together with drain valves and control valves, and some other simple seals and parts; these mostly solve most of the faults that Kinetico softeners develop. If your Kinetico has a head like the one shown here below, the Rebuild Kit will fit your softener. If your Kinetico head, looks like this model shown above, maybe has different resin storage, you will be able to service yours too. The design is common to all softeners. Most Kinetico water softeners will run for many years without fault. However, when faults do occur the actual fault is often a very simple thing to rectify; what is more, they mostly only need cleaning to bring back to life. The DVD will show you how to break down, clean/service and assemble. These water softeners can be serviced quite safely and cleaned by the average DIY person, but it is essential to know what the common faults are and how to rectify based on the symptoms. We show clearly main problem points and what to look out for. We include breakdown of parts and fault finding in PDF format. We include full exploded drawings of Water Softener PDF. We include full fault finding diagnosis charts PDF. We include detailed descriptions of parts PDF. There is a full detailed breakdown of the Kinetico water softener metering system head and full breakdown of all levels of the head. 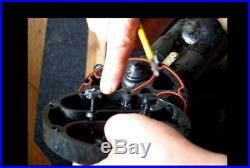 The DVD provides a full tutorial which you can use to dismantle and re-assemble. We show where to clean and where to use the important silicone grease to maintain. Save a fortune on Service calls. Brand New Video Format - Shows Step by Step Instructions. The Unique Kinetico Re-Build Pack. Kinetico Water Softener Service Pack. Complete Kinetico Quad Ring Kit. Now including the special Silicone O ring set - Very difficult to obtain normally. Control Valve Quad Ring Seals. Purge Valve Quad Ring Seals. Drain Valve Piston Quad Ring Seals. Drain Valve Internal Piston Quad Ring Seals. Outlet Valve Piston Quad Ring Seals. Outlet Valve Internal Piston Quad Ring Seals. Balance piston internal O rings seals. These are of the highest quality and are manufactured to the highest standard. They are genuine Quad rings or X rings as some prefer to call them. We now include the special RED Silicone - actuator and balance piston O ring set. Kinetico Water Softener Service & Repair Video (#272516791364). 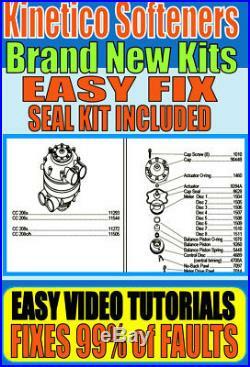 Seals installed just like the dvd.. Kinetico Water Softener Service and Repair DVD + Service Quad Seal Kit (#272524884182). Kinetico Water Softener Service and Repair DVD (#272529745576). 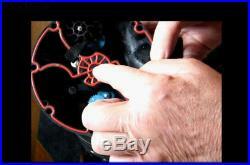 Kinetico Repairs - Easy DIY Servicing - DVD - Spare Parts - Quad Rings (#272489001683). Kinetico Water Softener Service Kit - Complete Quad Pack (#272444734562). Kinetico Water Softener Service and Repair DVD (#272432464218). Kinetico Water Softener Service and Repair DVD + Service Quad Seal Kit (#272432465160). We now only supply both items together. It is essential to install these components in a particular way. We can only guarantee you will be successful when you follow our instructions. Your lifetime service could cost you more than the cost of your softener itself. And also let us be very clear, you would likely only need to replace the seal kit once in your softeners lifetime. But, the super DVD Tutorial can be used again and again for regular service intervals. This really is a special deal. Now we include every important seal within the Kinetico Softener Head. We will not guarantee to supply these items indefinitely, grab a bargain today! The item "Kinetico Water Softener Repairs Parts Rebuild Kits Fixes Every Model" is in sale since Tuesday, February 6, 2018. This item is in the category "Home & Garden\Home Improvement\Plumbing & Fixtures\Water Filters". The seller is "kinetispares" and is located in Swindon.